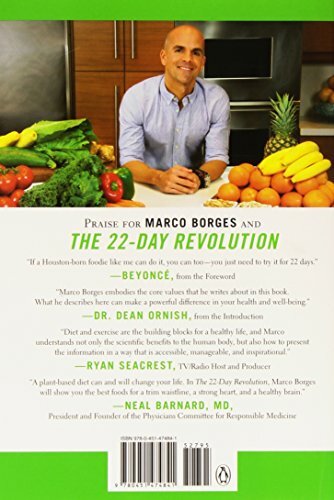 A groundbreaking vegan program designed to transform your mental, emotional, and physical health in just 22 days—includes a Foreword by Beyonce, and an Introduction by Dr. Dean Ornish. Founded on the principle that it takes 21 days to make or break a habit, The 22-Day Revolution is a plant-based diet designed to create lifelong habits that will empower you to live a healthier lifestyle, to lose weight, or to reverse serious health concerns. The benefits of a vegan diet cannot be overstated, as it has been proven to help prevent cancer, lower cholesterol levels, reduce the risk of heart disease, decrease blood pressure, and even reverse diabetes. As one of today’s most sought-after health experts, exercise physiologist Marco Borges has spent years helping his exclusive list of high-profile clients permanently change their lives and bodies through his innovative methods. Celebrities from Beyoncé, Jay-Z, Jennifer Lopez, and Pharrell Williams, to Gloria Estefan, and Shakira have all turned to him for his expertise. 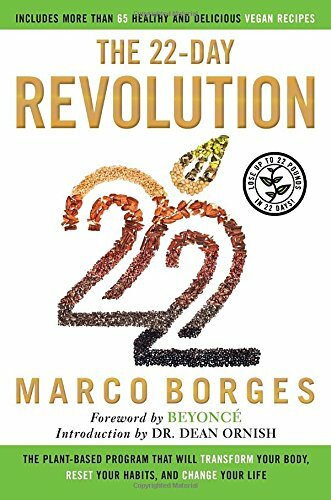 Beyonce is such an avid supporter that she’s partnered with Borges to launch 22 Days Nutrition, his plant-based home delivery meal service.